St. right-believing prince Daniel was the fourth son of prince Alexander of Neva. He was born in 1261 and became to reign in Moscow in 1280th. It should be noted, on that time Moscow was small and not rich appanage, and even princes were there not quite often. So Daniil Aleksandrovich became a founder of princely dynasty of Moscow. The Saint in his daily life was righteous, humble and peace-loving. His hagiography states that Daniil Aleksandrovich, having enlightened mind, wisely reigned in his princedom. He was a brave warrior and protected his lands firmly. Similarly to other Russian governors, Daniil Aleksandrovich took a part in internecine wars. But moscow prince was pretty peaceable, what was very rare in that time. The majority of conflicts between his brothers-princes he tried to resolve in peace. That is why ancient singers called Daniel «the One who loves his brothers». Daniil Aleksandrovich himself showed no desire to reign over anyone. He honored the Law of succession to the throne and did not raised a sword against his older brothers during a struggle for the Title of Great Prince. St. Daniel’s peace-loving gave to him love and respect of contemporary people. A lot of people came to Moscow from different princedoms: nobles, craftsmen, farmers… Prince Daniel welcomed everyone who required refuge. Prince gave a work to everyone according to his bent, always taking care about wellbeing of his citizens. Soon land of Moscow became populous. New villages appeared, a lot of farmers and occupations. Moscow during the reign of prince Daniel was gradually built and strengthened. City did not disappeared even after terrible devastation during the march of the commander of the Horde Tudan. All together people Moscow rebuilt their city. And again prince Daniil Aleksandrovich showed to everyone an example of unprecedented mercy. He gave all his property for needs of those who suffered of devastation and for restoration of Moscow. And city was quickly renewed. Soon there were no sign of Tatar storm. Daniil Aleksandrovich was an example of true righteousness for everyone. He cordially took care for spiritual enlightenment of his citizens. During St. Daniel’s reign Moscow became a religious center. That has begun when prince founded the monastery of St. Venerable Daniel the Stylite, who was a heavenly patron of St. prince Daniel. His hagiography says about this event: «During his godly reign in the land of Moscow, the blessed prince Daniel built the monastery beyond Moscow-River which is called after his name Danilovsky, created the church of honor of his angel St. Venerable Daniel the Stylite and assigned an archimandrite there». Danilov Monastery is the first among monasteries which exists for today. Precise date of its foundation is unknown. Historical literature indicates 1272 or 1282; sometimes just «the end of XIII century». Recently comparative studying of historical evidences allowed scientists to assume that the monastery was founded in 1298-1299. In 1303 St. Prince Daniel got sick hardly. Before his repose he followed an example of his father, the Great Prince Alexander Yaroslavovich of Neva, and took monastic vows. Prince of Moscow commanded to bury him in the monastery which he created, not in the church, but on the common cemetery because of his deep humbleness. Prince Daniel reposed on March 5 of 1303. Hagiography of St. Daniel’s of Moscow says about miracles which were made by him after his death. One day Great Prince Ivan III Vasilyevich passed near an ancient Danilov Monastery, where relics of St. Daniel were. A horse of one noble young man stumbled; he was fell behind by prince’s suit and remained alone. Suddenly, the stranger appeared ahead the young man. The youth was afraid and stranger started to speak: «Do not afraid of me, because I am a Christian and the lord of this place. My name is Daniel of Moscow. According to God’s will I am entombed here – on Daniel’s place. Go, young man, to Great Prince Ivan and tell him: «There, you seeking to comfort yourself in many ways, but why did you forgot of me»? But even though he forgot of me, God of mine never did». And the stranger disappeared. The young man immediately overtook the Prince and told him about miraculous vision. Since then the Great Prince ordered to make pannychidas and prayer services; he arranged dispensation of alms and meals for remembrance of his reposed relatives, who died in goodness. Here is another miracle. During a reign of Ivan the Terrible, one merchant lived in Kolomna. One day together with his son he went to Moscow by boat for trading. The son got sick on a way. The merchant came to the church where St. Daniel’s relics were, brought his ill son to the tomb and started to pray. Immediately his son received healing and they continued their trip. Since then father started to venerate St. Daniel. Every year on the day of his son’s healing he was coming to St. Daniel’s tomb, making prayer service and dispensing the alms. Less than 30 years since the right-believing prince Daniel reposed, the monastery, founded by him, was moved to Kremlin in 1330 (it was founding of Transfiguration monastery), the church was turned into simple parish, cemetery became public and St. Prince’s grave was lost. Russian people always remembered the righteous life of Daniil Aleksandrovich with gratitude. On August 30 of 1652 the relics of St. Daniel of Moscow were found incorruptible. They were laid into silver tomb placed in the church of Seven Ecumenical Councils in the Danilov Monastery. St. Right-Believing Prince Daniel of Moscow was canonized for local veneration only in 1791. Up to 1930 St. Daniel’s relics were in Danilov Monastery; at that time the last monastic church was closed. Then, for a while they were in the Church of the Resurrection near Danilov Monastery. In 1932 that church was closed too and relics disappeared. Today in Danilov Monastery are several particles of St. Daniel’s relics, which are placed in reliquary, ark and icons. The particles of relics of St. Right-Believing Prince Daniel of Moscow, which are in reliquary, were given to the monastery by the Most Holy Patriarch of Moscow and of All Russia Alexy II on March 17 of 1995. Its story descends to 1920-1930. Relics are in pencil-case-looking ark with unskillful, but reverentially made image of St. Prince Daniel and belonged to bishop, whose name is unknown. In the middle of 1930s he was exiled to the North, and before he went there he has given those relics to professor I. Anichkov, who had it for many years. Before his death Anichkov gave the shrine to Academician Dmitry Likhachov, asking to return it to Danilov Monastery when it will be possible. Dmitry Likhachov entrusted the holy relics to archpriest John Meyendorff who took it to USA in order to keep it safe. 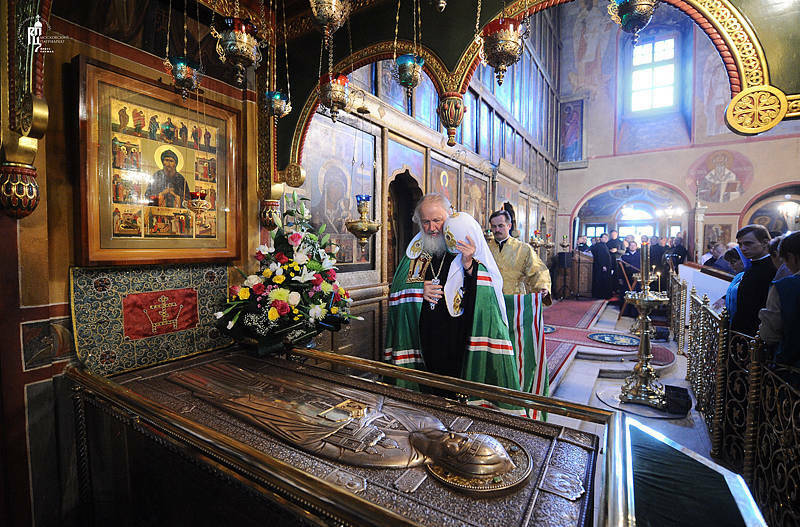 In 1995 relics were returned to Russian Orthodox Church. The reliquary is in the church of the Holy Fathers of the Seven Ecumenical Councils, under the northern arch. Above the shrine carved wooden canopy installed. Particles of the relics of St. Right-believing Prince Daniel which belonged to last Rector (before monastery was closed) of the cloister Archbishop Theodor Pozdeevsky (†1937), were given to Danilov Monastery by Primate of Autocephalous Orthodox Church in America Metropolitan Theodosius on May 30 of 1986. The ark is in St. Trinity Cathedral near central northeast column. In the Church of Protection of Virgin Mary are two icons with particles of St. Daniel’s relics. Big icon was painted in 1980s and now is on the column between two iconostasis. The relics which are in that icon were given to the monastery from Orenburg Diocese soon after the cloister was opened. Another icon with the relics is just for veneration; it is a smaller one and located on the lectern in the middle of the church. A particle of the holy relics of St. Right-Believing Prince Daniel of Moscow permanently are in St. John Cathedral of Brooklyn. It is one of other 114 particles of relics of another Saints. The Cathedral is always opened for those people who want to pray and to venerate the shrines. Oh, St. Venerable Prince Daniel, we come to your icon and cordially pray you: support us (names) by your charity, because we are gather under the covering of your prayers. Spill your warm intercession to Savior of all, may He grant peace to this parish and this church, may He keep it safe, bringing righteousness and love for people; may He eradicate spite, internecine and corruption of tempers. Give to all of us by your prayers everything what is good for temporary life and for eternal salvation, and for that we shall glorify Christ, Who is marvelous in all His Saints, together with Father and Holy Spirit, to the ages of ages. Amen. St. Venerable Prince Daniel, pray the Lord for us! In the article were used materials of portal «Orthodoxy and the World» and of official web-site of Danilov Monastery." "The monks of the Holy Danilov Monastery, whose history dates back to the 16th century, also bake bread.... Here bread is baked on a professional level. Next year in the context of the article meant 2015. So, many improvements must have been implemented in the intervening years. "Monks made their own bread in Russia for centuries, until the Soviets closed or converted the monasteries. Now they’re baking once again in the Danilovsky Monastery...[which is] guarded by uniformed Cossacks. The pink Gate Church of St Simeon Stylites is the main entrance to the Monastery on the north wall. On the ground floor, the bells are housed above it. You can buy fresh loaves from kiosks near the gold-domed church in the monastery’s high white wall. In 1930... an American industrialist bought the eighteen bells in this entrance tower and gave them to Harvard University. Saved like this from being melted down, they were returned in 2008. 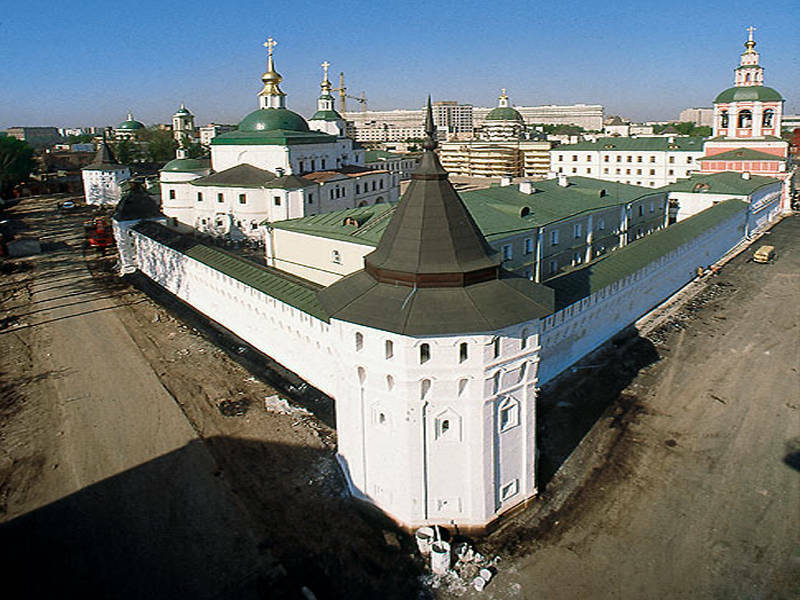 Prince Daniel founded the monastery in the thirteenth-century so it claims to be Moscow's oldest, although the buildings are more recent. The lovely seventeenth-century Cathedral of the Holy Fathers has several chapels on two levels, full of smoky incense and beeswax candles. There was not much I could do without access to the Russian internet where choice might be available, but here is the only picture of the relics of St Prince Daniel Alexandrovich in the Church of the 7 Fathers via English search engine. You will have to imagine the beautiful shrine without the figure in the foreground. If I find a better illustration, I will post it. Joseph Bové, architect of the Bolshoi Theatre, designed the neo-classical Trinity Cathedral next to it. The Danilovsky monks produce around five thousand loaves a day, using wheat flour that is grown and milled on the monastery’s own farm, in the countryside near Ryazan, 100 miles southeast of Moscow. The monastic farm also keeps bees and sells the proceeds in a holy honey shop. The monastery’s little canteen serves hot drinks..."
There are in the history of Christianity and in the history of Russia moments which we would like to remember forever—both in assessments of what is happening in the world and in relation to the life of a concrete person. For, once, 2,000 years ago, humble fishermen from a small Roman province overcame the whole world. And for 300 years their followers were exterminated, were misunderstood and driven out; however, in the end they prevailed against all logic by patience and meekness. We see the same thing in the life of Right-Believing Prince Daniel of Moscow. In 1282, together with his brother Andrei and other princes, he came out against another brother, Dmitry. However, at their first meeting at the city of Dmitrov, thanks to the efforts of the saint, a peace was concluded without bloodshed. When in 1293 St. Daniel’s brother, Grand Prince Andrei Alexandrovich, together with conscripts from the Tatar Hordes with Dyuden at the head (“Dyudenev’s army”) were ravaging Russian cities, the right-believing prince decided to allow them into Moscow to preserve the people from destruction. The saint brought the enemy the keys to the city to avoid bloodshed, and together with his people, he survived the barbaric attacks. In 1300, when St. Daniel crushed the treacherous prince of Ryazan with his Tatar collaborators, he did not use his victory to take others’ land or to take rich spoils, as was customary in those days, but gave an example of true selflessness, love, and brotherly love. In the life of the holy prince compiled by him, Metropolitan Platon of Moscow writes of the great work of this ascetic of piety: “This original founder laid the foundation of Moscow’s present greatness, laying for it by his peaceful steps but a small path.” And here is recalled a story from the Old Testament. Elijah, the great prophet, in a difficult time for him when the Israelites persecuted him and worshiped idols, besought the Lord to appear to him. The prophet was given such an answer: “Go out, and stand on the mountain before the Lord.” And behold, the Lord passed by, and a great and strong wind tore into the mountains and broke the rocks in pieces before the Lord, but the Lord was not in the wind; and after the wind an earthquake, but the Lord was not in the earthquake; and after the earthquake a fire, but the Lord was not in the fire; and after the fire a still small voice (3 Kg. 19:11-12). The life and labors of the holy Right-Believing Prince Daniel of Moscow are an example of true Christian courage for us, worthy of the memory not only of rulers and politicians, but even the most ordinary Christians. It was courage—to love against all odds and to remain faithful to the evangelical commandments when the logic of events happening around us negate it. History again and again justifies the truth that the most solid foundation for every work is the rock of the love of Christ, for Blessed are the meek, for they shall inherit the earth (Mt. 5:5)."